I have been working with wood sense I could stumble into the shop with my dad. About a year ago I moved into a house with no space for a full shop so I decided to take up all hand tool wood working, and that started a whole new passion for wood. now I feel as though I am learning the art all over again. come along for the ride! These Hand drills were given to me by My Grandfather and before that belonged to his grandfather so they have been in the family for at least 5 generations. Now that is an Heirloom tool. I started by the hand drills apart slowly figuring out how each nut and bolt came off. 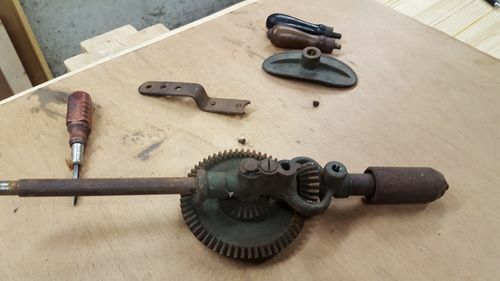 To remove the rust from the hand drills I soaked them in a bath of vinegar for 24 hours. then scrubbed them and resoaked for 24 hours. Next every part of the hand drill was scrubbed and quickly dried and oiled to prevent rust. Every part that was not going to be painted was masked off with blue painters tape then the hand drill parts were painted with two light coats. 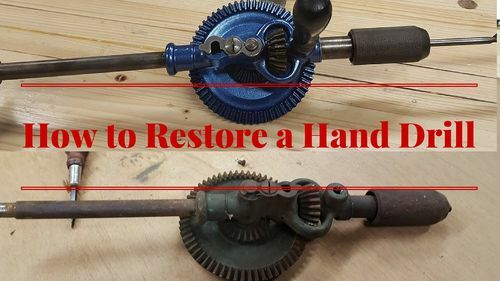 The Reassembly of the Hand tools is really where it comes together (LOL) here you really get to learn about the Hand Drill and what its quarks are. Hay Jay, I recently got a 45 and 55 Stanley and I’m having trouble setting the depth of the blade to actually make cuts. I wanted your You2 videos but didn’t see how you setup the depth of the blade relates to the skates to get smooth cuts. Any advise? Hay Jay, I recently got a 45 and 55 Stanley and I m having trouble setting the depth of the blade to actually make cuts. I wanted your You2 videos but didn t see how you setup the depth of the blade relates to the skates to get smooth cuts. Any advise? For me there are two ways of doing it. if it is just a groove iron I eye down the skate and advance the iron tell I just see it poking out. usually about 1/32” (A bit fat but for a grove it is not an issue) if the blade is a molding or shaped blade I sight along tell before it sticks out the test it, and then advance the blade a bit and test it again. I will keep advancing and testing it tell I get the fine shaving I want. very slimier to how I would setup a smoothing plane for a very fine cut. I hope that answers your question. if not feel free to email me at [email protected] I would love to help you any way I can. I am a subscriber of yours on your Youtube channel. A few weeks ago you mentioned you were attending the MWTCA in Carlinville, IL. I’m planning on attending this show, but am unable to find the location it is being held in. I was hoping you could shed some light on this. Sorry for putting this here as I am aware there is a place for private messages, but seeing as I am more of a viewer and not a poster I am unable to send private messages at this time.